Who Was King Solomon in the Bible? Many people have heard of King Solomon. He was probably best known as the king who built the first Jewish Temple around 957 B.C. But, King Solomon was also known for many other things. 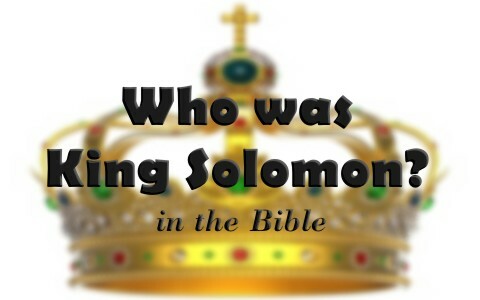 Who was King Solomon in the Bible? We first hear of Solomon as being born to David and his wife Bathsheba in Jerusalem after the death of their son that was conceived through adultery (2 Samuel 5:14; 2 Samuel 12:24). Solomon’s name comes from the Hebrew word Shelomoh, which means peaceful. As a boy, Solomon was entrusted by David to his prophet Nathan to train him. Nathan called him by the name Jedidiah, which means friend of God. God ordained that Solomon would be the successor to the throne despite not being the oldest son. Not long after Solomon became King, God visited him in a dream and told Solomon to ask God what He should give him (1 Kings 3:5-15; 2 Chronicles 1). Solomon replied saying that God had given his father David great mercy and a son to sit on the throne. He continued by saying that he was “but a little child” and did not know how to proceed as the king of God’s people. He then asked that God would give him and understanding heart to judge God’s people so that he could discern between good and bad. God was pleased with Solomon’s request. He said that because Solomon had not asked for long life, riches, nor the lives of his enemies, but instead understanding to discern judgement, He would give Solomon a wise and understanding heart. God added that there would be no one like him then or after him. God said that He would also give Solomon great riches and honor. God concluded by saying that if Solomon walked in God’s ways that He would give him a long life. Solomon woke from this dream and immediately went to Jerusalem and stood before the ark of the covenant of the Lord to make offerings and a feast for all his servants. It was not long after that the wisdom that God had given him was demonstrated. While judging a case between two women who each claimed they were the mother of the same newborn baby (1 King 3:16-28). Both women had newborn babies and one of the babies died in the night so the mother of the dead baby swapped the babies. When it was discovered in the morning, the women were fighting over whose baby had died. King Solomon immediately commanded that the baby be cut in half by a sword and each woman receive a half. One of the women cried out for King Solomon to give the baby to the other woman while the other woman was indifferent to the dividing of the baby so that neither would be awarded the living baby. Solomon declared that the woman who cried out was the real mother because she would rather give up her baby so that he would live instead of being killed. The people were astounded by his wisdom to get to the truth. Solomon’s father, David, desired to build a permanent temple for God while he was on the throne. However, God told David that because he had shed blood, he would not be allowed to build it. Instead, God told him that He had chosen his son Solomon to build it. David gave instructions to Solomon about how God wanted the temple built and provided everything that Solomon needed. Likewise, the people were so overjoyed that they willingly gave offerings to the Lord. The temple was started in the fourth year of Solomon’s reign and completed seven years later (1 Kings 6). David died before the temple was built. The Bible tells us that Solomon also built houses for himself. One was a personal home and the second was built as a house the he would use to judge court cases (1 Kings 7). This “courthouse” is where Solomon heard and decided cases. It was quite lavish and built from the finest of materials. He also built a house for his Egyptian wife, whom he married to make peace with Pharaoh (1 Kings 3). Solomon accumulated and spent great amounts of money on a lavish lifestyle like no other person in history. As we just learned, Solomon had an Egyptian wife. He went on to marry 700 wives and had 300 concubines or mistresses (1 Kings 11). Many of the women worshiped false Gods. This led Solomon to also worship false Gods, which had a negative impact on his life. We can see from Solomon’s weakness and desire for adulterous relationships that it eventually cause the loss of many blessings from God. Because of Solomon’s polygamy and lavish lifestyle, his time became more consumed with worldly and idolatrous pursuits. This led to Solomon ignoring the Lord’s directives, which angered God. Therefore, the Lord raised up enemies to attack and take away a large part of the kingdom from Solomon. God explained that He allowed this to happen because of Solomon’s worship of other gods and not walking in God’s ways. (1 Kings 11). God did not forsake Solomon, but Solomon’s actions greatly influenced the kingdom in a negative way. It is sad that Solomon had all the wisdom in the world provided to him, yet, he also made choices that were unwise. Solomon is responsible for writing a great amount of Scripture (1 Kings 4:23-34). He wrote Ecclesiastes, Proverbs (Proverbs 1:1), and Song of Solomon. Some believe that Proverbs 30 and 31 were written by others. Song of Solomon was part of more than one thousand songs that he wrote (Song of Solomon 1:1; 1 Kings 4:32). Regardless of what or how much he wrote, what we have in the Bible that was written by him was inspired by the Holy Spirit (2 Peter 1:16-21). What can we learn from Solomon? We learn from Solomon two main points. First, when we seek God’s will, God will provide a way for it to be accomplished. Whether it is wisdom, provision, protection, or preference, we can learn that when God is for us, nothing can prevail against us (Matthew 6:24-34; Romans 8:26-39). Second, we can learn that despite God’s provision for our salvation, wants, and needs, we can also still make bad choices because we still have fleshly desires while we live on this earth. These fleshly desires will constantly want to rebel against what God tells us (Romans 7:14-8:23). Solomon was probably best known as the king who built the first Jewish Temple around 957 B.C. He was also known for his great wisdom and riches. Solomon was born to David and his wife Bathsheba in Jerusalem after the death of a son that was conceived through adultery. God ordained that Solomon would be the successor to the throne despite not being the oldest son. Solomon sought God’s help to be a good king and God blessed him with riches, fame, and a long life because he was pleased with Solomon’s request. Despite all of God’s blessings, Solomon still made bad choices that affected his people. Do you believe that Solomon went to Heaven when he died since he had strayed so far from God? Hello Regina. Yes, I believe Solomon will be in the kingdom and I would say we all stray from God at times; some far, some not so far, but Solomon’s words in Proverbs & Song of Solomon show that He was still being used by God. Read the very last chapters of his writings in Ecclesiastes, which came late in his life, and you can see he knew God and once again strived to obey God, and thus, yes, I believe God saved him. We shall meet him in person someday. Also, Solomon wrote, “for the righteous falls seven times and rises again, but the wicked stumble in times of calamity” (Prov 24:16). It is not our to judge that. Hello Mateusz. I don’t think Regina is judging Solomon but asking whether he was still saved since he had drifted so far from the will of God, therefore, I don’t believe Regina is judging Solomon but just asking a question about his being saved or not after all the sin he did. Previous post: What Is The Didache? Is It Inspired By God?